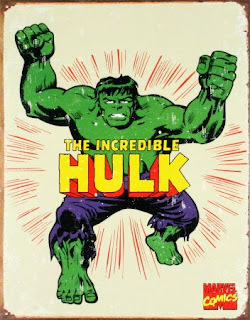 The Billionty-Oneth Geek: Incredibly HULKed! The Incredible Hulk is the second feature produced by Marvel Studios after May's release of Iron Man. This was not a sequel to the 2003 version by Ang Lee nor was it a remake; simply put, it was Marvel hitting the reset button and starting over again. And if this film is any indication of what Marvel has in stored for the future, then things are looking good for the geekdom. The movie starts off with a quick summary of the Hulk's origin, all done within the opening credits. The movie then catches up to Bruce Banner who is in hiding from American authorities while trying to discover a cure for his condition. He has cut off all communication with the world except for one mysterious character known as Mr. Blue, who he communicates through instant messaging. The American military led by General Thunderbolt Ross tracks down his whereabouts and sends a group of soldiers to capture him in order to exploit his condition. Banner, who escapes their attacks eventually ends up back in America where he reconnects with Betty Ross and continue their search for a cure. The rest of the movie then becomes a cat-and-dog chase between Banner and Betty with General Ross and a soldier named Blonsky. If you payed attention to the production of this movie then you'll know that Edward Norton and Louis Leterrier & Marvel were constantly butting heads about the direction of the movie. Norton who helped pen the script (under the name Edward Harrison), wanted a more story & character driven movie while Marvel wanted a more action based movie. I can't blame Marvel for feeling at odds with his script, I mean, Ang Lee's version of the movie, while critically acclaimed, was a financial bomb and was disliked by the general public because of its slower, more story driven approach. They were just trying their best to avoid a repeat disaster. While Lee's version was layered with parallel stories between the broken relationships of fathers and sons/daughters, Leterrier's version is a more typical action-filled chase story. Leterrier, who did the Transporter films and Unleashed, is no stranger to action, and does a pretty fine job of knitting together action scenes while at the same time never making it feel tiring. The end boss final battle between Hulk and Abomination is probably one of the best fight sequences of all Marvel movies. Overall, I think I enjoyed Lee's version more, for trying to take a new direction with superhero movies instead of making it another action-based fodder. That said, I still enjoyed the popcorn summer blockbuster approach by Leterrier; it was what it set out to be. One of the things that added to my enjoyment was all the subtle hints of potential sequel ideas as well as continuity with other Marvel properties. One big hint is with the quirky Tim Blake Nelson who may be playing the "lead" villain in a sequel. Another huge hint is the ending, featuring a cameo by another well known property. Some of the geeky easter eggs to look/listen for (*spoiler-ish*): Stark Industries software, Dr. Reinstein, Super Soldier Serum, Nick Fury, S.H.I.E.L.D. There may be a ton that I missed, but these are the ones I caught, and each one filled me with glee. The actors did the best with what they were given, although for some characters it wasn't much. Notably, Liv Tyler's Betty Ross and Tim Roth as Blonsky seemed a bit wooden. There was no real emotion to them, and no real connection to the audience. However, casting William Hurt as General Ross was a great move, as he always delivers. Overall, it was a fun movie. I recommend catching it on a big screen with big sounds. Oh, there was no hidden scene after the credits, so save your 5 minutes for something else.